We’ve been in the NICU for a week, and I’m pretty sure I’ve already gained a reputation as being “that Mom.” The one who comes to meetings with her binder and list of qustions. The one who asks for everything to be repeated to be sure she has recorded it accurately. The one who researches everything they say and makes her wishes known. The one who has already read every piece of research written on her child’s diagnosis and talked to countless families dealing with it. I know all about “that Mom” because in my profession, I’ve sat across from her, on the opposite side of the table, at various times during the last 9 years. Being a teacher has taught me to be “that Mom” in the most respectful, polite, (yet firm) way possible as I’ve been on the receiving end of some “not so friendly” ‘that moms.’ I’ve had specialists tell me, “you’re very prepared.” I’ve had doctors tell me, “you already know a lot about this.” I’ve had nurses reply, “we’ve heard about your wishes. ” I’ve seen ‘the eye raises, gotten the extra calls (the ones we always make sure to give to “those moms”), and already changed what the doctors were going to do for her care on a number of occasions just because I truly know this disease more than most of them. (Praise the Lord there are GI doctors here that know her disease much better than me. I think I would lose my mind if there weren’t). The funny thing is, I’m a total poser, because what I really feel like is a deer in the headlights, the new kid in school, or maybe just a total scatter brained basket case. I’ve met “that Mom” many times in my teaching career, and I certainly don’t fit the description. She is prepared, strong, organized, confident, determined, knowledgeable and wise, and I’m barely hanging on right now. No, I’m not “that Mom,” because as “prepared” as I tried to be, as much research as we did pre-delivery, as many families as we contacted, there are just a few things you can NEVER be prepared for on this journey. 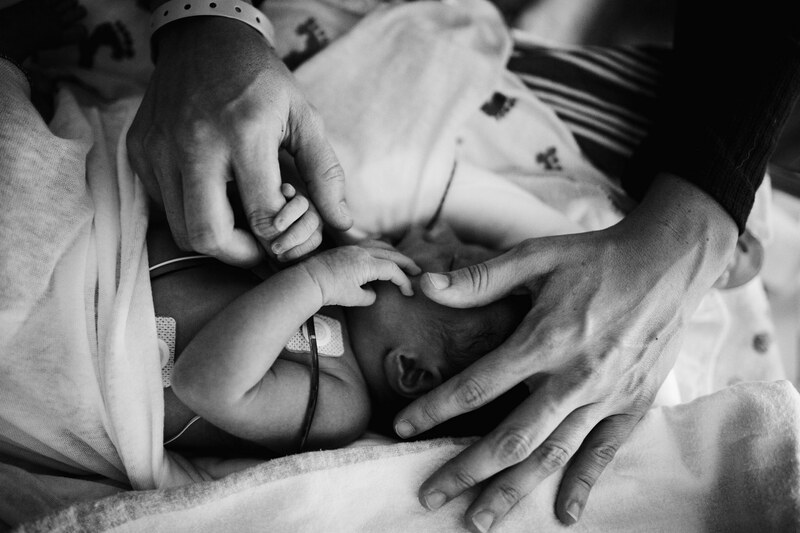 After a week in the NICU, it has become very clear to me that there are three things that no matter how much you try, you simply can not prepare for. No matter how many times I dotted my I’s and crossed my T’s, these three things came at me with a force so swift, so strong, and so surprising that I could never have been ready for them. First, you can not prepare yourself for leaving your well child. There is absolutely no amount of spending quality time before it happens, or planning for sitters, or enjoying every second that can somehow make up for that crushing feeling that comes with being separated from your healthy child. You can’t get ready for what you will feel when you drop your little boy off at daycare as you head to the hospital in labor, knowing that from this day forward, his life will NEVER be the same. Nothing can get you ready to watch the elevator close with him waving back at you, or to hear him yelling “Mommy” on the phone as you hang up. Jonah is okay. He’s happy and so well taken care of. My Mom and Dad, brother and sister-in-law, his school teachers, not to mention countless others have bent over backwards to be there for him. I knew an extended separation was coming, but it’s a feeling you simply can’t prepare for. Leaving your well child hurts. Secondly, you can not even remotely begin to prepare for the helplessness you will feel towards your sick child; to sit next to her bed, to hear the doctors conversations about her, to watch the nurses stick needles in her head, or hear some procedure or medicine or organ “isn’t working.” You can know how serious her condition is, and yet, when she’s here and you hold her and feel a pain so deep you didn’t even know it existed before now. ; nope, you can’t prepare yourself for that. The helplessness that comes from watching your sick child, and knowing there is absolutely nothing you can do to change it, is something you can never, ever be ready for. Thirdly and lastly, you can’t begin to prepare yourself for the outpouring of love that your friends, family and perfect strangers will shower upon you as they watch your situation unfold and desperately want to do something to help you. You can’t prepare to see your family drop everything to sit beside you, or care for your child, or do your laundry. You can’t get ready to hear a friend tell you she ended up in the hospital because she was literally so sick with worry for you. You can’t know what it will feel like to see people you love weep with you and for you until you see the real tears roll down their faces. I knew people would care but you can’t prepare to receive stacks of letters, and home made teddy bears, and pillow beds, and food; to watch them drop off gifts for your son’s birthday because his party was cancelled. You can’t know what it feels like to receive the sweetest cards in the mail with money for parking and gas cards, and offers to hold fundraisers, or for strangers to offer to take family pictures to be sure you always have them. You simply can’t know how much people will truly step up and want to do something, anything, to ease your pain until the pain is staring you in the face, and they are sitting there beside you, truly, genuinely sharing in your pain. I will do everything I can to be “that Mom” for my Belle girl. I’ll do my research and try my best to prepare for meetings, and consults, and clinics. I’ll fight tooth and nail, praying that I can do it with the same grace Jesus has shown me. But I’ve learned very quickly, there are some things on this journey, I will NEVER, EVER be ready for. Still praying. You need to be Belle’s voice. You are that Mom! Take care of yourself too. Love and hugs! Now that I’ve cried a gallon of tears reading this; know that we are still praying for all of you. I can only imagine what you’re going through, but I do know that God does know and he will take care of you. On a similar level, I spent 5 months in Trauma units, rehabs, strange towns hundreds of miles from home and although Jim wasn’t my newborn,, it does have some of the same emotions– and in that way I understand. Hang in there. Let people take care of you. There is a Greater Plan and some day you will understand. God doesn’t make mistakes. I know, in many ways, you “get it” Rose Anne. I will be calling you soon. Praying God makes His presence know to you in some way every day you are in this “unprepared battle.” Whether He chooses to show Himself in a big way or through a still small voice, I pray you notice. He is prepared. He is holding you and Belle and Joe and Jonah. Thank you, Bri. We have already seen Him show up in various ways. Take care! 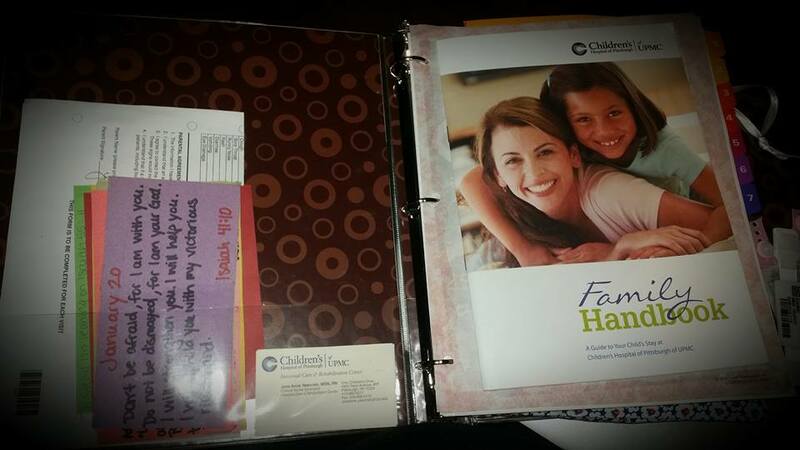 You are a great “THAT MOM”, And having binders is a great thing,, look at all the research you have done for the next person on this journey, you are the voice of many. Prayers for strength to your whole family. Nice to meet you, Rena. Take care of my Mama. She is an amazing person. Take care! You may not realize it now but you have a great gift in your ability to write. Writing can be cathartic and healing but it also offers a glimpse into the writer’s soul. The people who are caring for your daughter know this and will strive to do their utmost to give her the best care possible. They will also care for you and your husband. You are “that Mom”, Belle’s advocate and protector. How I wish I could bring a miracle and place it into your hands. Our prayers for Belle and for your entire family continue each day. Thank you so much for your kind words, Rhonda. We truly appreciate your prayers. Never apologize for being “that Mom” – remember that your strength and courage and love are all gifts for your family! Belle is a special girl just like her Mama! Thanks, Cat! Joey is special as well!!! Laura, know that we will be praying for your little one as well all those involved in her care. Pray that God will give you (your family) the strength you need for each and every day, maybe moment. Thank you so much, Mr. and Mrs. Vanregenmorter. Miss your sweet daughter!